A blog for the my love of Warhammer 40K. It's mainly battle reports written in a narrative format but will also cover a few other posts and musings. I hope you enjoy. The battle of the Drona Steppes followed the Imperial attack on Mount Drona. 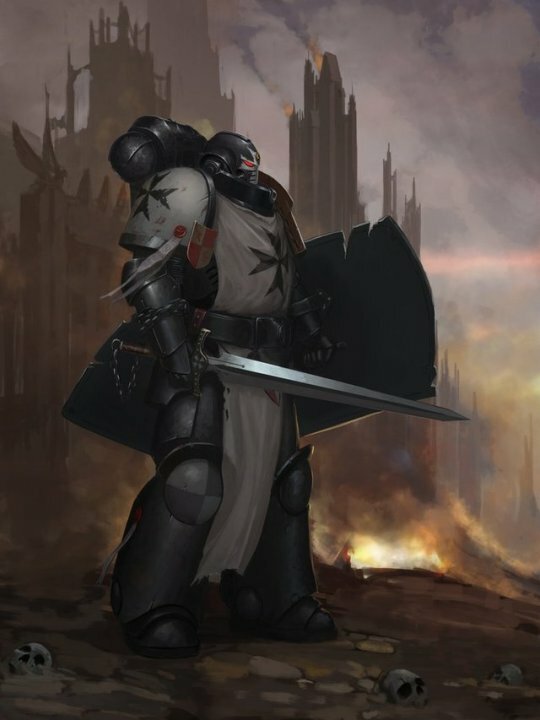 The Black Templars, led by High Marshal Helbrecht and Grimaldus, a counter attack against the cultists pouring from the tunnels beneath the local industrial buildings. Although outnumbered, the space marines fought through to the heart of the Cult in the region. Genestealer Cult (Twisted Helix) vs Space Marines (Black Templars). A couple of weeks ago my friend Jamie challenged me to a game and brought along his Black Templars space marines. I was really pleased by this as I didn't think we had anyone at the club who played this specific chapter. To make things even better for me, Jamie included both Helbrecht and Grimaldus in his list. At this time I had not had an opportunity to play any of the missions from Chapter Approved 2018 so Jamie picked one that he thought sounded good. We rolled Search and Destroy as our deployment which I thought considering the amount of LOS blocking terrain would actually do me good. Unfortunately the Space Marines got the first turn and I was extremely surprised at how quickly they got around the cover to be able to get some shots off at me. Once again I really found myself locked into my own deployment zone. Unless the dice gods were with me I would fighting to just hold my position. As the first few turns progressed, the Templars charged down my right flank and assaulted the rockgrinder trundling towards them. They did some damage but the sturdy construction managed to absorb more wounds than the odds would have allowed. It didn't stop them bringing it down soon after though and although I used a stratagem to detonate the bombs on board it only succeeded in killing one marine. On my left flank the main body of the space marine force was advancing forwards under cover of fire from a land raider crusader. That beast of a tank was decimating my brood brothers like they were nothing. Where the Templars charged my poor forces were cut down with ease. Once I had the opportunity to bring in some reinforcements I figured I could at least do some damage even if the game was in the hands of a superior opponent. The genestealers, patriarch and primus clawed their way out of the sands behind his marines on the left flank although in an awkward position, and using a stratagem I popped up my hybrids 4 inches behind Helbrect, with their hand flamers pointed directly at him. Molten premotheium poured from the hand flamers at the leader of the Black Templars. I rolled 21 wounds and even though Helbrecht has a 2+ armour save I expected to do something. Instead he passed every single one. In retaliation the mighty space marine commander sliced them down in assault. The genestealers did not fair much better. I charged but I could not make much in the way of saves and a handful fell on the way in. I did well in cut down a few marines but their attacks back decimated the genestealers and then the space marines turned all their firepower onto the remaining primus and patriarch. Victory to the Black Templars. It was a good game but I don't think I really got to explore the mission as I was too busy fending off brutal assaults. This was another game where my dice let me down so many times while my opponent's dice were working entirely in their favour. It's hard to do anything when the game is against you like that. Even so, it was really good to play against Black Templars again - the last time was under 4th edition! Geek, gamer, and all round weird egg. I have been involved with hobby gaming for 30 years now playing a variety of games.